Winter weather calls for hearty fare at the dinner table. 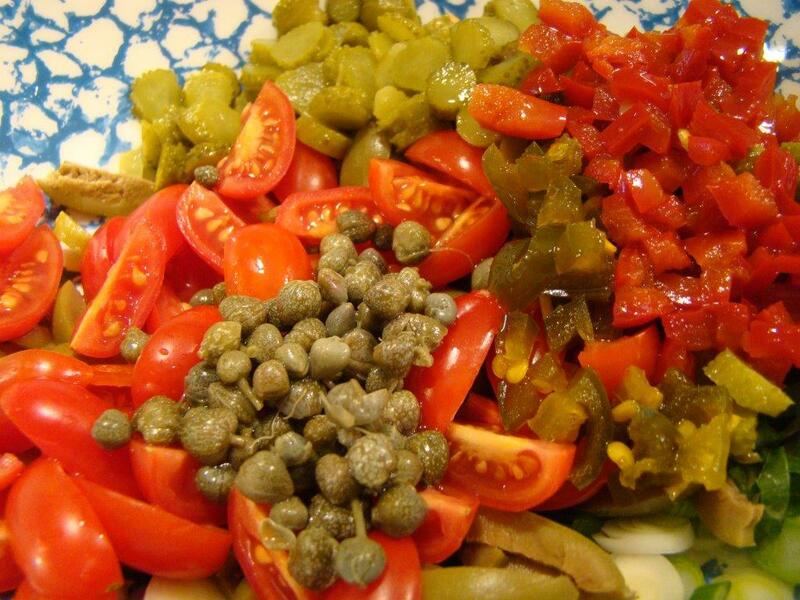 With the arrival of another foot of snow on Wednesday, this week’s recipe for French Fridays with Dorie fit that bill. 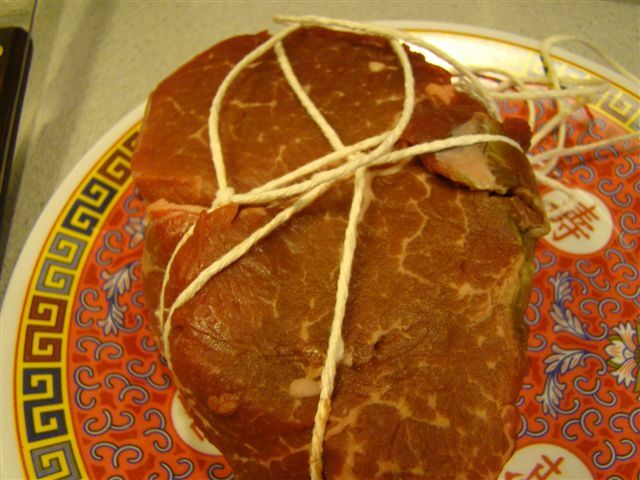 Have you ever heard of boeuf à la ficelle, or beef on a string? I hadn’t. No great surprise because Dorie says even in France, this is une recette perdue (a lost recipe). Beef on a string isn’t the most inspiring name. 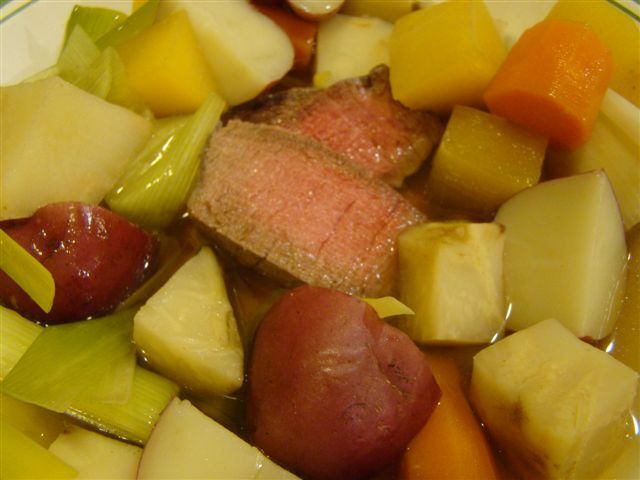 Believe it or not, we’re talking about beef tenderloin and winter vegetables poached in homemade bouillon. The homemade bouillon was a bit of mystery. 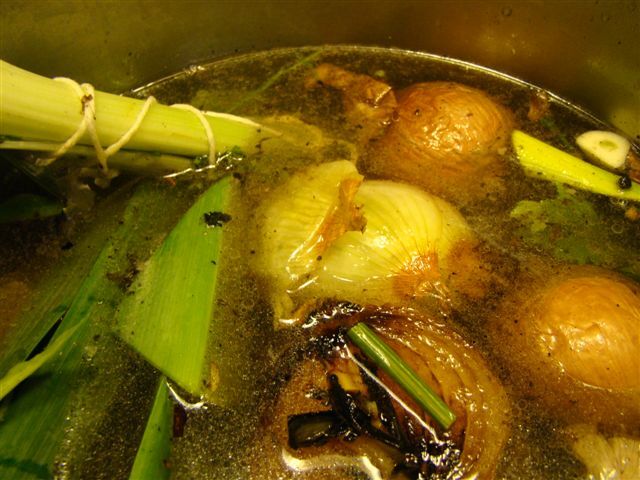 What’s the difference between bouillon and stock? The best answer I could come up with is that stock is made from bones and bouillon made of meat. The bouillon resembled stock, but in addition to some marrow bones, it also called for an oxtail, which is pretty meaty. The bones, oxtail, and onion are browned, then simmered with other vegetables and some spices. In the end, Dorie says to discard all the solids because they’ve given up their flavor. I’ll admit that as a good “dog mom”, I picked the meat off the oxtail pieces and scooped the marrow out of the bones to dress up Bella’s meals this week. She hasn’t seemed to notice any lack of flavor. 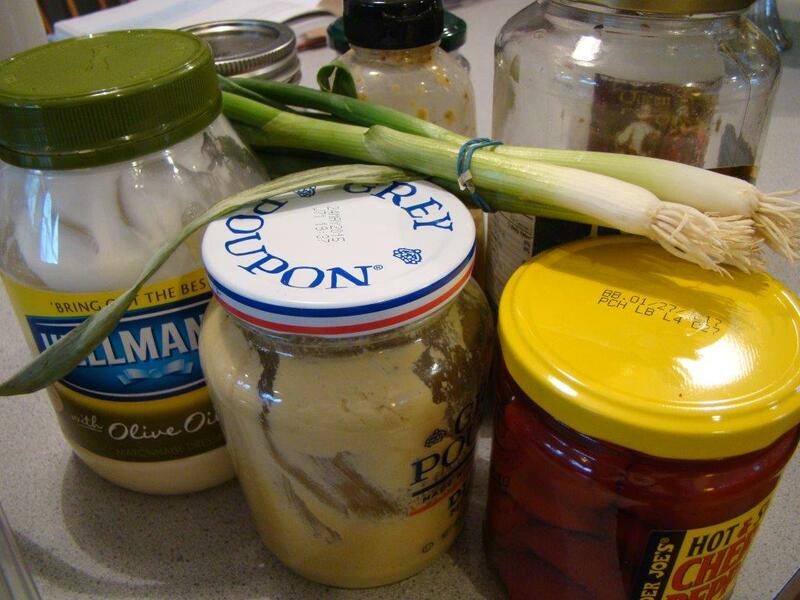 To make dinner, I simmered an assortment of vegetables, most of which I had in my mini root cellar in the basement (i.e. a big plastic container filled with sand next to the drafty door) in the bouillon. For the beef, I used a tenderloin filet which was about half the size called for, but perfect for the two of us. I tied the beef up with string (to make it easy to retrieve from the pot, I guess) and poached it in the bouillon until it was rare. 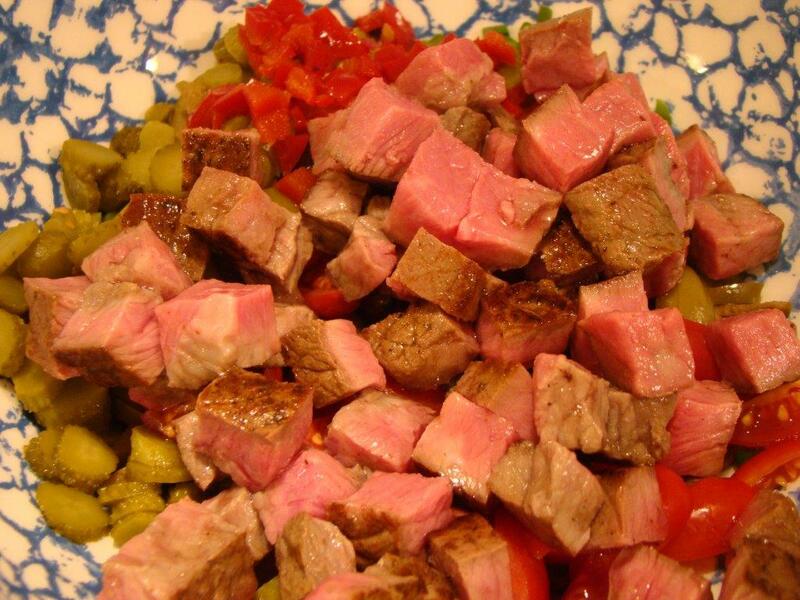 This makes a lovely presentation: sliced beef surrounded with vegetables in a sea of bouillon. 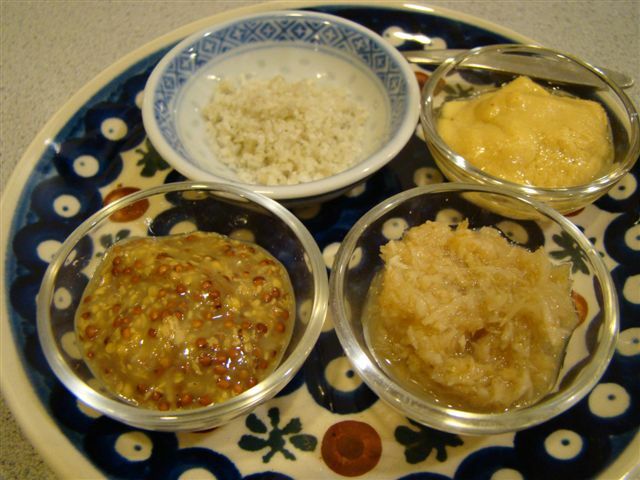 I served with Dijon and seeded mustard and horseradish to let us each season the bowl as we wished. I particularly liked the zing the horseradish and mustard gave to the bouillon in the bowl. And Howard rated this three thumbs up, very high praise! 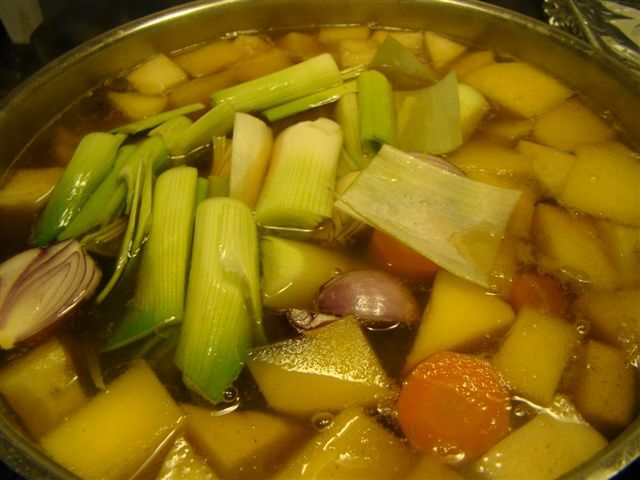 We have enough beef and vegetables for another night of leftovers, and there is so much bouillon left, I see some beef and barley soup on the weekend’s menu. An everlasting meal. My favorite kind. 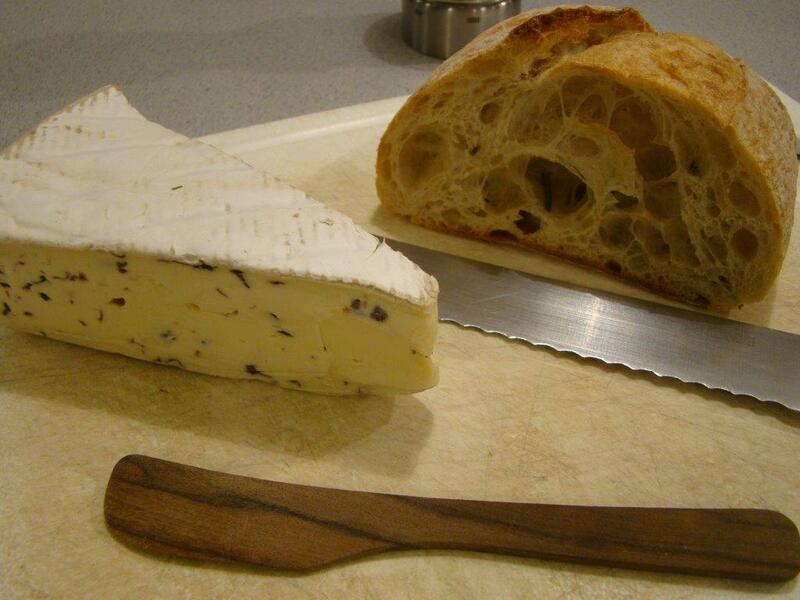 The recipe is available on-line here or you can find it in Dorie Greenspan’s book Around My French Table. 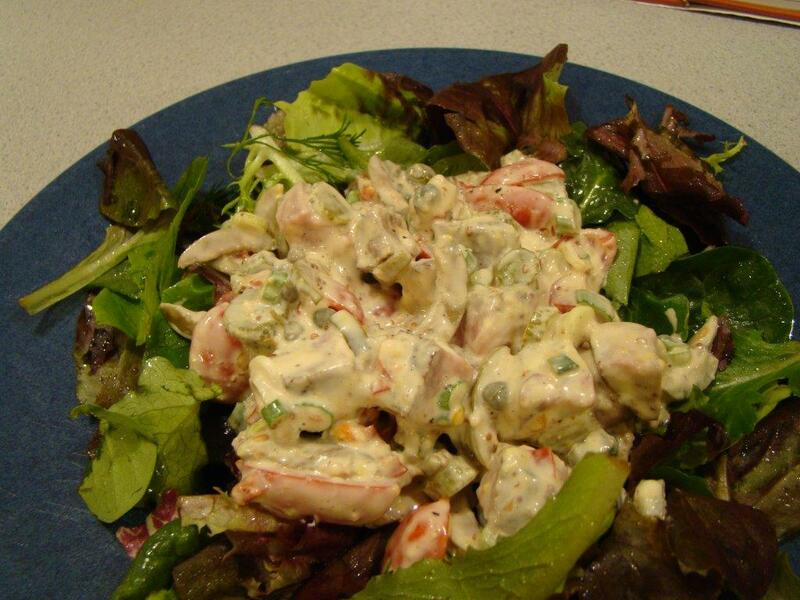 To see what other Doristas thought of this recipe, check out their posts here.